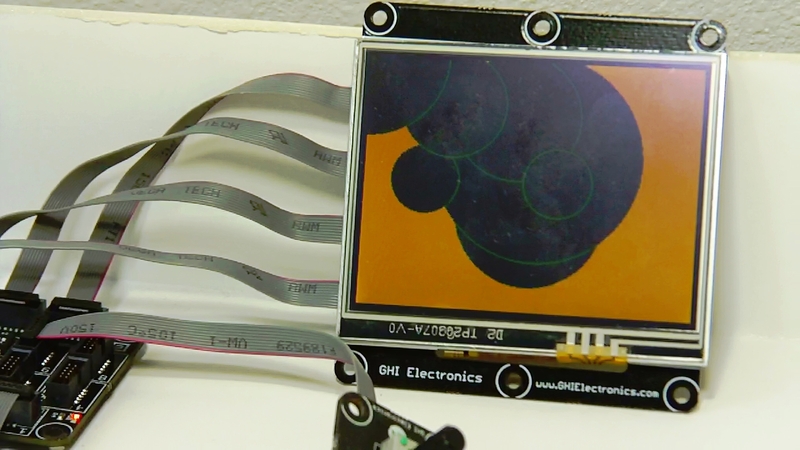 This example uses the GHI Electronics Display_T35 module, the Potentiometer, and a Button to demonstrate use of the Display Module Simple Graphics interface. The application displays circles, or symmetrical ellipses, on an orange background based on the coordinates of a Window.TouchDown event. The size of the circle is determined by the potentiomenter setting. // Use the out parameters to get the position of touch. // Multiply by 100 to get into integer range before conversion. The Display_T35 touch screen displays circles where a touch occurs, as shown in the following illustration. To clear the display, push the button. This entry was posted on October 26, 2011, 3:04 PM and is filed under Embedded Microcontrollers. You can follow any responses to this entry through RSS 2.0. You can leave a response, or trackback from your own site.